Rather than worrying what kind of drinks you're serving at your next dinner party, maybe you should be thinking about what sort of fancy ice cubes you want to make. You'll feel refreshed just looking at these. Get the full instructions at OhMyVeggies.com. Some ideas: blueberries, strawberries, lemon slices, fennel, and mint. Freeze dog toys and treats in a cake mold. Puree watermelon in a blender. Place a strainer lined with a coffee filter over a measuring cup. Pour the pureed watermelon and leave for 20 minutes. Discard the pulp and coffee filter. Stir in lime juice and sugar and lambanog to taste. Fill bag one at a time, twist the top of the bag and make a knot to seal. Place filled bags in an upright position in a container if desired, otherwise lay them flat on a smooth surface, and let freeze for several hours. Check out Oggi for more ice candy ideas. Crush up a fruit of your choice (watermelon, raspberries, etc. ), mix with lemonade, and freeze. Pour milk and water in a saucepan, add sugar, cocoa and instant coffee and mix carefully to avoid lumps. Bring to a boil over medium heat then remove from heat. Pour mixture over the chocolate, melt 5 minutes then mix gently with a wooden spoon to get a cream smooth and creamy. Cool and pour into an ice cube tray and freeze. This recipe courtesy of Sandra Kavital's blog. Click here for the full tutorial on how to make these. 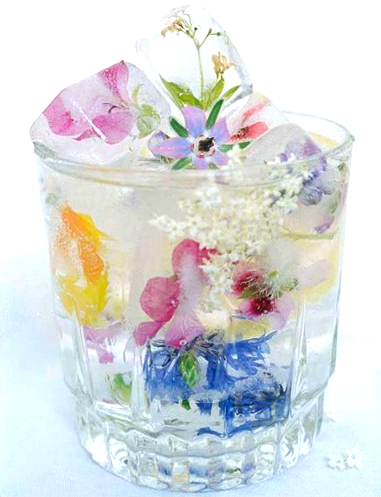 Freeze edible flowers in your ice cubes. Recipe courtesy of Martha Stewart Weddings, click here for the alcoholic Campari version. Place a bottle of liquor into an empty 2-liter plastic bottle with the top cut off. Fill the sides with water and fruit, and freeze. Keep your iced coffee from getting watered down by serving it with coffee ice cubes. Or add milk to make latte ice cubes. Just add food coloring to your ice cube tray. Mix lime juice and sugar till dissolved. Add water mix and pour into 2 ice cube trays. Place 1 lime wedge and 1 mint leaf in each section. Top with additional water if need. Freeze til solid. Recipe from Rita on Food.com. According to The Improvised Life red wine is best enjoyed between 55 and 65 degrees or cellar temperature — which none of us actually do. Get there with these frozen grapes. Hibiscus tea makes for such prettily colored ice cubes. Place in a glass of iced green tea. Use a large ice cube tray and alternated layers of pineapple juice and coconut milk. It works best if you do thin layers and fully let each layer freeze before adding the next. Add your beautifully striped cubes to fresh muddled pineapple, coconut milk and rum for the most delicious summer treat. This recipe comes from Justina Blakeney's blog..